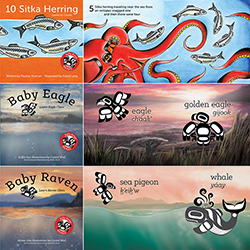 Sealaska Heritage Institute (SHI) has released the first three of eighteen culturally-based children’s books that reflect the Native worldview. The books are part of the institute’s Baby Raven Reads, a program for Alaska Native families with children up to age 5 that promotes language development and school readiness. The series includes a counting book—“10 Sitka Herring”—which traces the fate of a herring school from 10 to one fish as they encounter Southeast Alaska predators. Herring and herring eggs are a subsistence resource and a staple of Native diets. The book was written by Pauline Duncan and illustrated by David Lang. Two other books—“Baby Raven” and “Baby Eagle”—teach the English and Tlingit words for clan crests. The clan crests were illustrated by Crystal Worl, who specializes in minimalist or “baby” formline, and the Southeast Alaska environmental illustrations were made by Nobu Koch. The first three books are geared for children up to age three, and SHI also will produce books for children up to age 5 in the coming years. The books will be available during Celebration 2016 and at the Sealaska Heritage Store.